Anderson was 22, under contact for Thistle Bicycles. She had labored in laundries by day and spent evenings as a seamstress to earn $3 a week. Eventually she purchased her first bicycle. Anderson started as a recreation cyclist when 100-mile centuries came into vogue. Her trainer-boyfriend Phil Sjöberg helped her develop speed and endurance. Anderson had blond hair, blue eyes, stood 5 feet 6, and weighed a lean140 pounds. She and rivals raced hundreds of events on steeply banked velodromes built in baseball parks, on fairgrounds, as well as small steep “soup-bowl” tracks in armories, roller rinks, and civic auditoriums. Women battled in a variety of 25-milers up to six-day events, limited to three hours of racing daily; sixes proved so dramatic that customers kept coming back to see more. She won races with $300 paydays—supporting her and Sjöberg in comfort. They planned to marry. 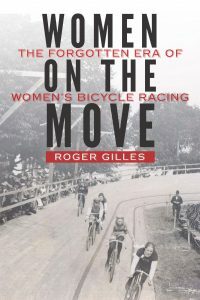 Gilles follows her and four others called the Big Five—Dottie Farnsworth of Minneapolis, who knew how to play to the crowd; Helen “Beauty” Baldwin of New York City; Berliner Lizzie Glaw; and Paris sprint champion Lissette, the nom de vélo of Amélie le Gaul. They generated oceans of newspaper and magazine articles, which boosted box-office sales. After 1902 Thistle bicycles most of the country’s 300 manufacturers either went bust, merged, or retooled to make automobiles. As a result, prize money vanished. That year, Anderson’s boyfriend Sjöberg died at age 23 from tuberculosis. When Anderson retired from racing she enrolled in a certification program to become a masseuse. She kept four scrap books bulging with accounts from newspapers, magazines, documents, and photos, including the Grand Rapids postcard. She lived to age 90 in and died 1965. In 2000 Anderson was inducted into the U.S. Bicycling Hall of Fame. Her memorabilia stayed in the family, passed from one generation to the next, and served as a starting point for Gilles’s research. He devoted two years to reading archived newspapers. In Women on the Move, Roger Gilles rescues a dynamic sports era. Anderson and her sisters in speed competed in front of crowds, created press attention, and received fistfuls of money.